It's also a few million dollars cheaper than a Chiron. What are you waiting for? We may now live in a time where horsepower may as well be ordered off the dollar menu. It’s far from impossible to get amounts of horsepower previously unimaginable and unattainable by the everyman—with everything from cheap modified Mustangs available from the dealership with warranties intact to SUVs with more horsepower than the latest mid-engine Ferrari—for under $100,000. What isn't as cheap or readily available are classic cars, especially those that were built in small numbers and defined a generation. Enter the Bugatti EB110 SS Dauer. You might recognize the first half of that name as the car that led Bugatti’s revival back into the modern ages and even influenced the styling and layout of the Veyron and Chiron. Only 139 were ever built, making them far more rare than even the Ferrari LaFerrari coupe, which of course is reflected in the price. The thing about this particular EB110 that's more enticing than other models is that it’s an exclusive rare version of the model. A rarity within a rarity. The SS designation means this is the upgraded version of the EB110 that’s been given a power boost and put on a diet. Total output sits at 604 horsepower being sent through all four wheels from a 3.5-liter quad turbocharged V12. Let it stretch its legs and it won’t relent its forward acceleration until it hits 216 mph after dazzling spectators with a 0-62 mph rush dealt with in 3.2 seconds. Impressive right? Even today those stats let it keep up with some of the hottest supercar royalty on the market, but is it really worth the $1,157,170 asking price? To answer that, let’s delve into the Dauer part of its name. 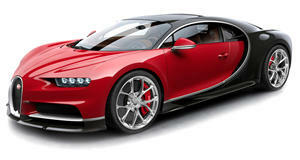 Even with such a cool car, Bugatti went bankrupt in 1995 and sold off its assets. Among those assets were five incomplete EB110 chassis, which were bought by a company called Dauer. The company completed the five EB110s and sold these cars off, the result being what we see before our eyes. Thanks to a road-shy owner, this example only has 1,050 miles on the clock. It's basically brand new and looks like it's never been touched since leaving the Dauer facility. Finished in a shade of Deep Black with a Lipstick Red interior, it has looks to seduce and the performance to kill. The logically minded might be interested in this Bugatti as an investment piece, but we truly hope an owner who will actually drive it will rise up and purchase this thing from Joe Macari Performance Cars in London. Any takers?